Fish Reproductions come in a far ranging degree of detail. All Fish Reproductions were at one time cast from an actual fish. But in the casting process, some minute detail can be lost. FEATHER RIVER ANGLER'S WORKSHOP uses the highest quality Fish Reproduction blanks obtainable. Even in this, many hours are spent to insure every detail of the live fish is obtained. In today's Fish Reproduction Taxidermy, accuracy is the name of the game if these mounts are to represent a living fish. After all, we have seen the poorly done mass produced plastic sailfish on the office wall. 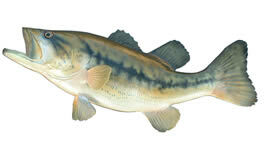 When done correctly, a reproduction can actually depict the live fish better than a skin mount can. This because the reproduction was cast when the fish was still fresh while skin mounts go through a drying and shrinkage process. I am not saying that skin mounts are inferior, not by a long shot, there are many talented Taxidermists that can achieve that lifelike look in a skin mount, but there are equally as many that cannot. fact that you do not have to send me a dead fish. You do not have to worry about it getting lost in the mail, spoiling in a hot warehouse or coming back to you a different size. It can also be a fish you caught three years ago that you now wish you had mounted or if you are strictly a catch-and-release fisherman, you can still display 'THE BIG ONE'. -click here to view close-ups-!